by Chris Woodford. Last updated: July 29, 2018. Touch a radiator and it feels hot. Dip your finger in tap-water and it feels cold. That's a no-brainer! But what if a polar bear, used to freezing Arctic temperatures, touched the same things? 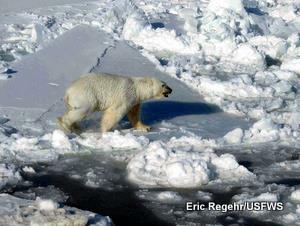 Both might feel hot to a polar bear because it lives in much colder conditions than we do. "Hot" and "cold" are relative terms that we can use to compare how things feel when they have more or less of a certain kind of energy we call heat. What is it, where does it come from, and how does it move around our world? Let's find out more! Photo: Now that's what I call heat! 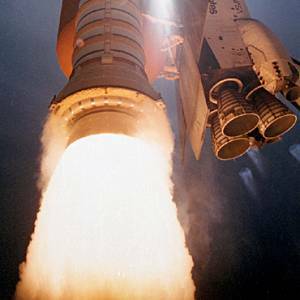 The temperature of the hot rocket exhaust you can see here, during a launch of the Space Shuttle, is something like 3300°C (6000°F). Photo by courtesy of NASA on the Commons. 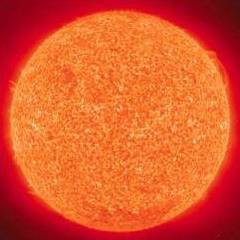 Photo: Most of the energy on Earth (including most of the heat energy) starts out in the hot ball of matter we call the Sun. Photo by courtesy of NASA on the Commons. Heat is a shortened way of saying "heat energy." When something's hot, it has a lot of heat energy; when it's cold, it has less. But even things that seem cold (such as polar bears and icebergs) have rather more heat energy than you might suppose. Objects can store heat because the atoms and molecules inside them are jostling around and bumping into one another like people in a crowd. This idea is called the kinetic theory of matter, because it describes heat as a kind of kinetic energy stored by the atoms and molecules from which materials are made. It was developed in the 19th century by various scientists, including Austrian physicist Ludwig Boltzman (1844–1906) and British physicist James Clerk Maxwell (1831–1879). If you're interested, here's a longer introduction to kinetic theory. The kinetic theory helps us understand where the energy goes when we heat something up. If you put a pan full of cold water on a hot stove, you're going to make the molecules in the water move around more quickly. The more heat you supply, the faster the molecules move and the further apart they get. Eventually, they bump around so much that they break apart from one another. At that point, the liquid you've been heating turns into a gas: your water becomes steam and starts evaporating away. What happens when something has no heat at all? Now suppose we try the opposite trick. Let's take a jug of water and put it in the refrigerator to cool it down. A refrigerator works by systematically removing heat energy from food. Put water inside a refrigerator and it immediately starts to lose heat energy. The more heat it loses, the more kinetic energy its molecules lose, the more slowly they move, and the closer they get. Soon or later, they get close enough to lock together in crystals; the liquid turns to solid; and you find yourself with a jug of ice! But what if you have a super-amazing refrigerator that keeps on cooling the water so it gets colder... and colder... and colder. A home freezer, if you have one, can take the temperature down to somewhere between −10°C and −20°C (14°F to −4°F). But what if you keep on cooling lower than that, taking away even more heat energy? Eventually, you'll reach a temperature where the water molecules pretty much stop moving altogether because they have absolutely no kinetic energy left. For reasons we won't go into here, this magic temperature is −273.15 °C (−459.67°F) and we refer to it as absolute zero. Photo: Ice may look cold but it's an awful lot hotter than absolute zero. Picture by Erich Regehr courtesy of US Fish & Wildlife Service. In theory, absolute zero is the lowest temperature anything can ever reach. In practice, it's virtually impossible to cool anything down that much—scientists have tried very hard but still not actually reached such a low temperature. Amazing things happen when you get close to absolute zero. Some materials, for example, can lose virtually all their resistance and become amazing conductors of electricity called superconductors. There's a great PBS website where you can find out lots more about absolute zero and the remarkable things that happen there. What's the difference between heat and temperature? Now you know about absolute zero, it's easy to see why something like an iceberg (which could be at the chilly temperature of about 3-4°C or round about 40°F) is relatively hot. Compared to absolute zero, everything in our everyday world is hot because its molecules are moving around and they have at least some heat energy. Everything around us is also at a much hotter temperature than absolute zero. Heat is the energy stored inside something. 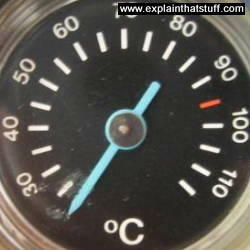 Temperature is a measurement of how hot or cold something is. An object's temperature doesn't tell us how much heat energy it has. It's easy to see why not if you think about an iceberg and an ice cube. Both are at more or less the same temperature but because the iceberg has far more mass than the ice cube, it contains billions more molecules and a great deal more heat energy. An iceberg could even contain more heat energy than a cup of coffee or a red-hot iron bar. That's because its bigger and contains so many more molecules, each of which has some heat energy. The coffee and the iron bar are hotter (have a higher temperature), but the iceberg holds more heat because it's bigger. How can we measure temperature? We measure temperature with thermometers using two common (and fairly arbitrary) scales called Celsius (or centigrade) and Fahrenheit, named for Swedish astronomer Anders Celsius (1701–1744) and German physicist Daniel Fahrenheit (1686–1736). There's also a scientific temperature scale called the Kelvin (or absolute scale), named for British physicist William Thompson (later Lord Kelvin, 1824–1907). Logically, the Kelvin scale makes much more sense to scientists because it runs upward from absolute zero (which is also known as 0K, without a degree symbol between the zero and the K). You'll see lots of Kelvin temperatures in physics, but you won't find weather forecasters giving you temperatures that way. For the record, a reasonably hot day (20–30°C) comes in at something like 290–300K: you just add 273 to your Celsius figure to convert to Kelvin. Photo: A thermometer measures how hot something is, not how much heat energy it contains. Two objects at the same temperature are equally hot, but one can contain a lot more heat energy than the other. One thing you've probably noticed about heat is that it doesn't generally stay where you put it. Hot things get colder, cold things get hotter, and—given enough time—most things eventually end up the same temperature. How come? There's a basic law of physics called the second law of thermodynamics and it says, essentially, that cups of coffee always go cold and ice creams always melt: heat flows from hot things toward cold ones and never the other way around. You never see coffee boiling all by itself or ice creams getting colder on sunny days! The second law of thermodynamics is also responsible for the painful fuel bills that drop through your letterbox several times a year. In short: the hotter you make your home and the colder it is outside, the more heat you're going to lose. To reduce that problem, you need to understand the three different ways in which heat can travel: called conduction, convection, and radiation. Sometimes you'll see these referred to as three forms of heat transfer. Photo: Conduction carries heat from the furnace in the center of this picture into all the pieces of metal that are touching it—making them red hot too. Photo by L.W. Wisenburg taken at Rock Island Arsenal courtesy of Defense Imagery. Conduction is how heat flows between two solid objects that are at different temperatures and touching one another (or between two parts of the same solid object if they're at different temperatures). Walk on a stone floor in your bare feet and it feels cold because heat flows rapidly out of your body into the floor by conduction. Stir a saucepan of soup with a metal spoon and you'll soon have to find a wooden one instead: heat travels rapidly along the spoon by conduction from the hot soup into your fingers. Picture: How convection pumps heat into a saucepan. The pattern of warming, rising soup (red arrows) and falling, cooling soup (blue arrows) works like a conveyor that carries heat from the stove into the soup (orange arrows). Convection is the main way heat flows through liquids and gases. Put a pan of cold, liquid soup on your stove and switch on the heat. The soup in the bottom of the pan, closest to the heat, warms up quickly and becomes less dense (lighter) than the cold soup above. The warmer soup rises upward and colder soup up above it falls down to take its place. Pretty soon you've got a circulation of heat running through the pan, a bit like an invisible heat conveyor, with warming, rising soup and cooling, falling soup. Gradually, the whole pan heats up. Convection is also one of the ways our homes heat up when we turn on the heating. Air warms up above the heaters and rises into the air, pushing cold air down from the ceiling. Before long, there's a circulation going on that gradually warms up the entire room. Picture: Infrared thermal images (sometimes called thermographs or thermograms) show that all objects give off some heat energy by radiation. 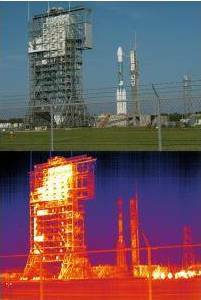 In these two photos, you can see a rocket on a launch pad photographed with a normal camera (above) and an infrared thermal camera (below). The coldest parts are purple, blue, and black; the hottest areas are red, yellow, and white. Photo by R. Hurt, NASA/JPL-Caltech, courtesy of NASA. Radiation is the third major way in which heat travels. Conduction carries heat through solids; convection carries heat through liquids and gases; but radiation can carry heat through empty space—even through a vacuum. We know that much simply because we're alive: almost everything we do on Earth is powered by solar radiation beamed toward our planet from the Sun through the howling empty darkness of space. But there's plenty of heat radiation on Earth too. Sit near a crackling log fire and you'll feel heat radiating outward and burning your cheeks. You're not in contact with the fire, so the heat's not coming to you by conduction and, if you're outside, convection probably isn't carrying much toward you either. Instead, all the heat you feel travels by radiation—in straight lines, at the speed of light—carried by a type of electromagnetism called infrared radiation. Why do some things take longer to heat up than others? Different materials can store more or less heat depending on their internal atomic or molecular structure. Water, for example, can store huge amounts of heat—that's one of the reasons we use it in central-heating systems—though it also takes a relatively long time to heat up. Metals let heat pass through them very well and heat up quickly, but they're not so good at storing heat. Things that store heat well (like water) are said to have a high specific heat capacity. The idea of specific heat capacity helps us understand the difference between heat and temperature in another way. Suppose you place an empty copper saucepan on top of a hot stove that's a certain temperature. Copper conducts heat very well and has a relatively low specific heat capacity, so it heats up and cools down extremely quickly (that's why cooking pots tend to have copper bottoms). But if you fill the same pan with water, it takes far longer to heat up to the same temperature. Why? Because you need to supply much more heat energy to raise the temperature of the water by the same amount. Water's specific heat capacity is roughly 11 times higher than copper's, so if you have the same mass of water and copper, it takes 11 times as much energy to raise the temperature of the water by the same number of degrees. 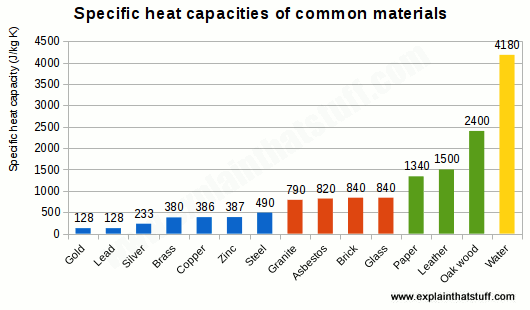 Chart: Everyday materials have very different specific heat capacities. Metals (blue) have low specific heat capacities: they conduct heat well and store it badly, so they feel cold to the touch. Ceramic/mineral materials (orange) have higher specific heat capacitors: they don't conduct heat as well as metals, store it better, and feel slightly warmer when you touch them. Organic insulating materials (green), such as wood and leather, conduct heat very poorly and store it well, so they feel warm to the touch. With very high specific heat capacity, water (yellow) is in a class of its own. Specific heat capacities can help you understand what happens when you heat your home in different ways in winter-time. Air heats up relatively quickly for two reasons: first, because the specific heat capacity of air is about a quarter of water's; second, because air is a gas, it has relatively little mass. If your room is freezing and you turn on a fan (convection) heater, you'll find everything seems to warm up very quickly. That's because you're essentially just heating up the air. Turn off the fan heater and the room will cool down pretty fast too because the air, by itself, doesn't have much ability to store heat. So how do you get your room really warm? Don't forget that there isn't just air in it that you need to heat up: there's solid furniture, carpets, curtains, and lots of other things too. It takes much longer to heat these things up because they're solid and much more massive than the air. The more cold, solid objects you have in your room, the more heat energy you have to supply to heat them all up to a particular temperature. You'll need to heat them up using conduction and radiation as well as convection—and that takes time. But, because solid things store heat well, they also take time to cool down. So, providing you have decent insulation to stop heat escaping from the walls, windows, and so on, once your room has reached a certain temperature, it should stay warm for some time without your having to add any more heat. Does more heat always make higher temperature? From what we've said so far, you might be forgiven for thinking that giving something more heat always makes its temperature rise. Generally that's true, but not always. Suppose you have a lump of ice floating in a pan of water and you place it on your hot stove. If you stick a thermometer in the ice-water mixture, you'll find it's around 0°C (32°F)—the normal freezing point of water. But if you keep heating, you'll find the temperature stays the same until pretty much all the ice has melted, even though you're supplying more heat all the time. It's almost as though the ice-water mixture is taking the heat you're giving it and hiding it away somewhere. Oddly enough, that's exactly what's happening! Artwork: Normally things get hotter (their temperature rises) as you supply more heat energy. That doesn't happen at the points when things melt (change from solid to liquid) and vaporize (turn from liquid to gas). Instead, the energy you supply is used to change the state of matter. The energy doesn't vanish: it's stored as latent heat. When a substance changes from solid to liquid or from liquid to gas, it takes energy to change its state. To turn solid ice into liquid water, for example you have to push the water molecules inside further apart and break apart the framework (or crystalline structure) that holds them together. So while ice is melting (in other words, during the change of state from solid water to liquid ice), all the heat energy you supply is being used to separate molecules and none is left over for raising the temperature. The heat needed to change a solid into a liquid is called the latent heat of fusion. Latent means hidden and "latent heat of fusion" refers to the hidden heat involved in making a substance change state from solid to liquid or vice-versa. Similarly, you need to supply heat to change a liquid into a gas, and this is called the latent heat of vaporization. Latent heat is a kind of energy and, although it may seem to be "hidden," it doesn't vanish into thin air. When liquid water freezes and turns back to ice, the latent heat of fusion is given off again. You can see this if you cool water systematically. To start with, the temperature of the water falls regularly as you remove heat energy. But at the point where liquid water turns to solid ice, you'll find water freezes without getting any colder. That's because the latent heat of fusion is being lost from the liquid as it solidifies and it's stopping the temperature from falling so quickly. Secrets of Heat and Cold by Andrew Solway. Encyclopedia Britannica, 2015. A question-and-answer-style introduction to the science of heat. Best for ages 8–10. Investigating Heat by Sally M. Walker. Lerner Publications, 2012. This one is about 40 pages and also suitable for ages 8–10. Energy by Chris Woodford. Dorling Kindersley, 2007. My own book about energy includes a short section on heat energy. Suitable for ages 9–12. Heat by Ian Mahaney. Rosen, 2007. A 24-page, basic introduction for ages 8–10. It covers much the same scope as this article (where heat comes from, conduction, convection and radiation, measuring heat, heat capacity, and a few basic experiments). Theory of Heat by James Clerk Maxwell. Longmans, 1871. Read Maxwell's statistical ideas about heat and the kinetic theory in his own words. The full text is available here in various electronic formats. Atoms under the Floorboards by Chris Woodford. Bloomsbury, 2015. One of my books for older readers. Chapter 13 is a simple introduction to heat and thermodynamics.